In Z's Hydra Slayer your goal is to clear a cave system filled with hydras of all kinds. Hydras have a nasty habit of growing heads back if the creature is not killed outright. Different weapons chop off different amount of heads, and thus some tactics are required. While a quite interesting mechanic, I don't quite buy it how a -6 weapon can't kill a hydra with less than six heads. It adds much complexity since carrying just a single big weapon won't help against the lesser inviduals. But it just doesn't make any sense. In addition to weapons, there are a fair number of other items to aid you in your quest. 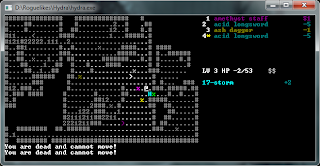 For instance, a potion of power juice grows an extra hand to carry one additional weapon, and a rune of cancellation prevents target hydra from regenerating. I didn't quite understand how everything works in the game yet; weapons seem to have colors/prefixes that correspond to the hydras. I'm not sure does that make the hydra immune to the weapon, or does it make the hydra more vulnerable. I have managed to get to level four so far. 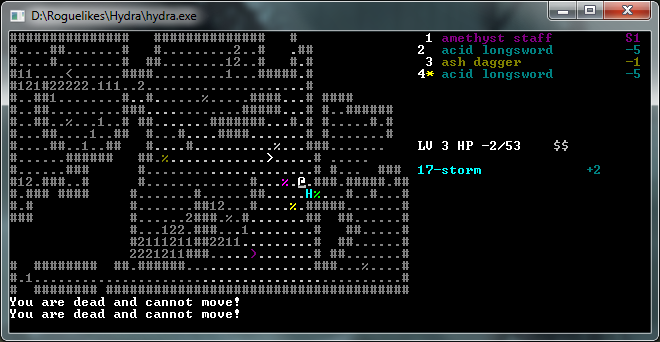 My demise seem to have always end up being some already powerful hydra, which I (incorrectly) hit with a big weapon that doesn't kill it and instead it grows more heads and becomes impossible to slay with current resources. The game is indeed challenging but as your knowledge of it grows, you progressively get further with each attempt. Totally worth of at least few deaths. It should also be noted that Necklace of the Eye fully supports the game. If you want to play it with correct colors, tiles, or even in hex, you might want to try it instead of just the plain game. As for why weapons are unable to kill a hydra which has not enough heads... well, my explanation is that all -N weapons are magical. This magic guides the weapon to the next head (until N heads are cut) and reduces the regrowth rate from, say, 3 new heads per each head cut, to 3 new heads in total. Very useful, but it comes as a cost: if you cut less than N heads, the unused power could cause some very bad effects, like, say, cutting the Slayer's own head. Anyway, this is what makes Hydra Slayer unique: a more powerful weapon is almost never universally better than a weaker one, and a bigger hydra is often easier to slay than a smaller one (sometimes it is worth it to make the Hydras stronger in order to slay them).